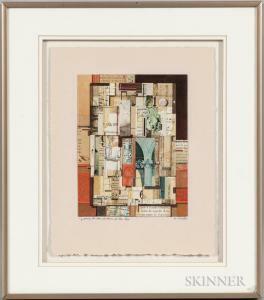 Find artworks, auction results, sale prices and pictures of Slater Roderick at auctions worldwide. Description: Roderick Slater (American, b. 1937) Getting to the Bottom of the Top. Signed "R. Slater" l.r., titled l.l. 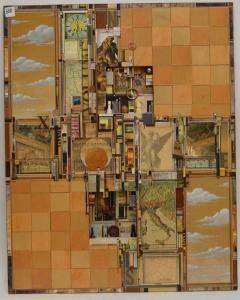 Mixed media collage laid down on paper, 7 3/4 x 6 in., framed. Condition: Floated in frame, not examined out of frame. Description: Roderick Slater (American, b. 1937) Getting to the Bottom of the Top Signed "R. Slater" l.r., titled l.l. 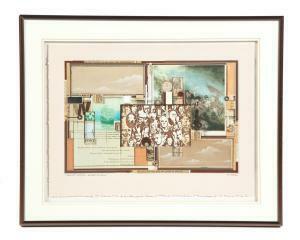 Mixed media collage laid down on paper, 7 3/4 x 6 in., framed. Condition: Floated in frame, not examined out of frame. FOUND MAIZE, CALLED IT CORN BY RODERICK SLATER (AMERICAN, B. 1937). Mixed media, signed lower right. 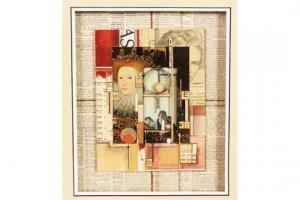 Mixed media with historic prints. Framed, 16.25"h. 20.25"w. overall. Roderick Slater (1937- ) American. \“4 BETWEEN 2\”, Acrylic and Collage, Signed in Pencil, overall 8.5\” x 6.75\”.